Back in the days of Feudal Japan, a samurai and an oni were engaged in a battle that they were too evenly matched to win. The samurai suggested that they seek out the Nakatomi Blade, a sword whom only the worthy could unsheathe. The oni failed to pull it from its scabbard, but the samurai succeeded, proving his superiority. In the present, storytime is interrupted by Fishface and the Foot Clan, who have disarmed the security system and entered the museum. 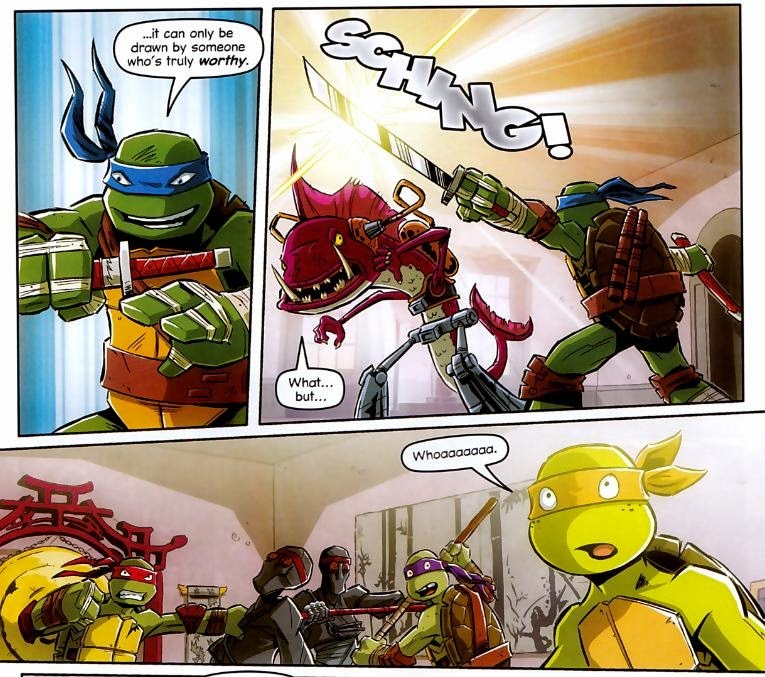 The Turtles drop in and while Don, Mikey and Raph deal with the Foot Soldiers, Leo takes on Fishface. As they banter, Fishface lets slip that the Shredder is after the Nakatomi Blade. Fishface grabs the sword, intending to use it against Leo, but can’t get the blade out of the scabbard. Leo tells him he’s unworthy. Fishface kicks Leo’s swords away, but Leo counters by nabbing the Nakatomi Blade. He then successfully unsheathes it and cuts the tubing feeding Fishface’s gills with water. Fishface and the Foot Soldiers promptly retreat empty-handed. Mikey basks in Leo’s glory, believing he was deemed worthy by the blade. Leo is flattered, but the truth is that the hilt of the sword is merely held fast to the scabbard by a latch and all he had to do was unfasten it. Before Leo can begin telling more stories about the other exhibits, Don gets the security system working again. Setting off an alarm, the Turtles make themselves scarce. 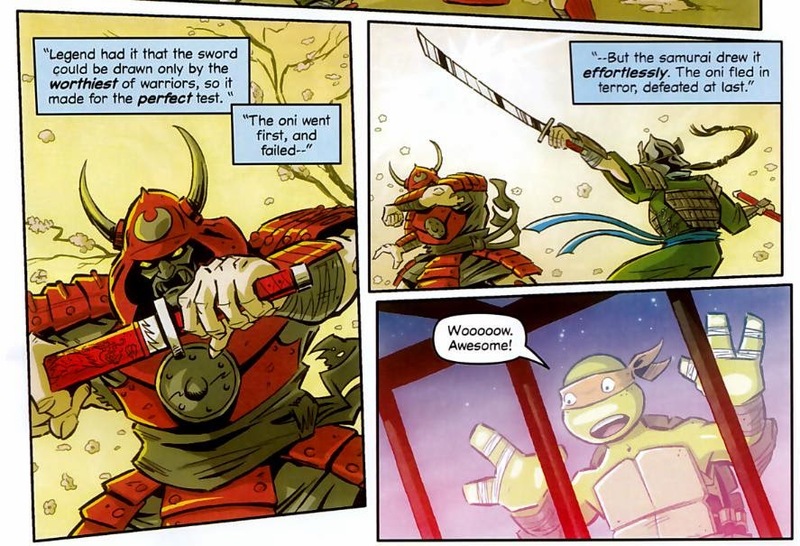 *This story is continued from TMNT Magazine (Panini) #12. The story continues in TMNT Magazine (Panini) #14. 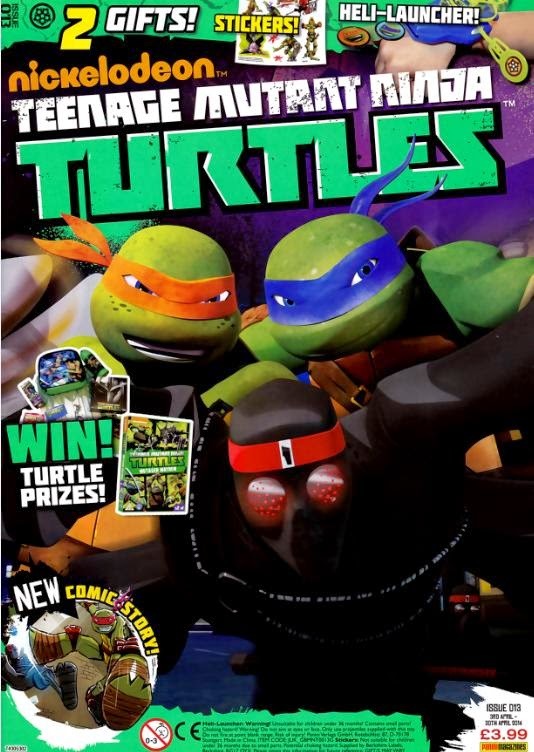 Due to contract and licensing kerflufflery, IDW is unable to distribute their TMNT New Animated Adventures comic in the UK, while Panini is unable to distribute their TMNT Magazine comic in the United States. So even though we aren’t able to share our comics across the Atlantic, there’s one thing we CAN share: The talent. Recent issues of TMNT New Animated Adventures have featured stories from TMNT Magazine talent such as Landry Walker, while recent issues of TMNT Magazine have featured stories from TMNT New Animated Adventures talent such as Erik Burnham. These guys get around. Burnham brings a different approach to his TMNT Magazine story than the usual stable of writers working on the magazine. Panini’s past authors have sort of stuck to a rigid formula, but they also try to cram as much plot into as many pages as possible. Burnham’s story is very light on plot and the majority of the tale is nothing more than witty banter between the characters as they engage in a typical skirmish with the Foot. It makes for a brisker read than the usual Panini stuff, but it’s also a really fun one as Burnham nails all the Turtles’ voices and gets across the fun of their dynamic. A BIG part of the actual Nick TMNT cartoon has been the witty dialogue, so its a nice change of pace to see one of these Panini stories focus on that over dense plots. Anyway, it’s pretty cool to see IDW and Panini sharing their talent in lieu of their content. When all is said and done, instead of getting reprints, it means we’re all getting more stuff overall. So maybe one day when the two publishers finally shake hands, there’ll be an even BIGGER catalog to go around between them.